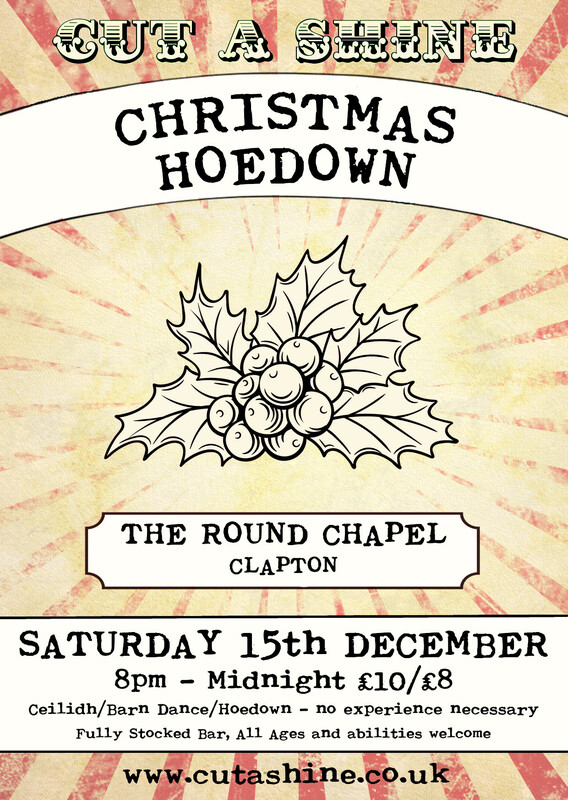 Get those dancing feet moving on the last weekend before Christmas with some proper partner dancing.... join Cut A Shine in the glorious Round Chapel for an unadulterated evening of Ceilidhs, Barn Dances and Hoedowns. As the evening progresses the dances get faster and more furious, until we're whipping up a storm. The Small Print: Fully Stocked Affordable Bar. Card Payments taken. Everybody is welcome to come and dance. No experience of ceilidh dance is necessary - dance callers walk you through all the moves before each dance. This will be a non-heteronormative dance. We will dance Scottish, Irish, English and American Dances, and the music will be mostly American Old Time music played on Banjo, Fiddle, Acoustic Guitar and Double Bass. Come dressed to dance in your best hoedown outfits.